Buyer's Point home theater wall plate binding posts are made with high quality gold plated copper connectors that resist oxidation and corrosion. No soldering or special tools required. Matching binding posts on the front and back of the wall plate are equipped with easy to install thumbscrews that are color coded for polarity. Includes Low-Voltage Mounting Bracket for an easy and secure installation. 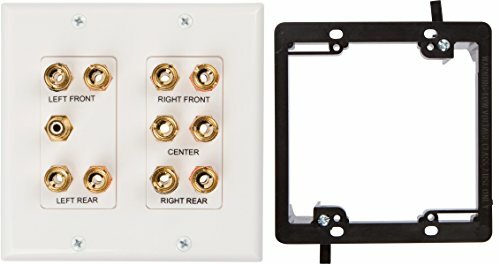 The Buyer's Point home theater plastic wall plates are easy to install and include all the screws you need to mount them into standard size gang boxes. Buyer's Point wall plates eliminate the clutter of wiring along your baseboards which results in a clean and tidy installation. This wall plate is white/ivory to coordinate with the existing color scheme of most homes. Buyer's Point home theater wall plates are designed to be used with banana plugs, spades or bare wire on both the front and rear of the plate. Allows connection of up to 5 speakers and 1 subwoofer. Accommodates banana plugs on both front and back sides of the plate at the same time depending on the inside depth of your gang box. Deeper gang boxes work better with installations like this. Banana jacks do not work withPaired/Dual banana plugs. Only works with single/individual banana plugs. Don't wait to order the Speaker Wall Plates you need today! Click "Add to Cart" now to have your brand new Speaker Wall Plate insert shipped from the USA rushed directly to your door!